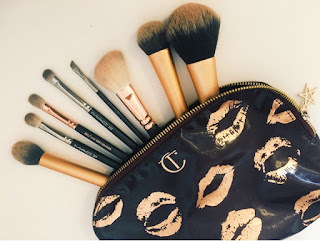 Today I am writing something I have never done before & that is the ever popular 'What's in my Makeup bag?'. 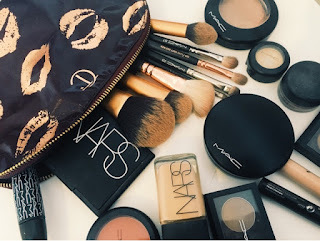 Along with 'Makeup Collections' it is one of my favourite things to read as I just love to have a nosey at other Bloggers Make-up! (doesn't everyone?). 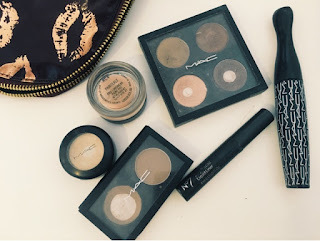 As this sort of thing has never been featured on Lolabelle Beauty before, I thought I would empty the contents of my own Makeup Bag and let you have a little look at the things I use on my face on a daily basis! I keep these products nestled in my Charlotte Tilbury make-up bag that (just about) fits all of my everyday essentials! I would love to know what your everyday make-up products are, leave me your links in the comments! 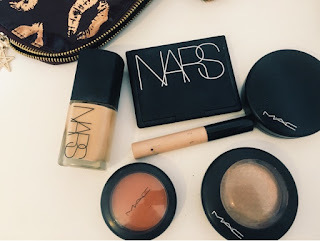 As I mentioned earlier, I wanted to feature a few products that I have been lusting over for quite a while and really want to add to my make-up collection. All of these products have been raved about on either YouTube or other beauty blogs so I really want to get my hands on them soon to see what all the fuss is about. Top Left: Kevin Aucoin Sculpting Powder £35 - I have seen this used on YouTube by the likes of Tanya Burr and Jaclyn Hill. It looks like the perfect contouring shade as it isn't too orange toned like a lot of bronzers can be. 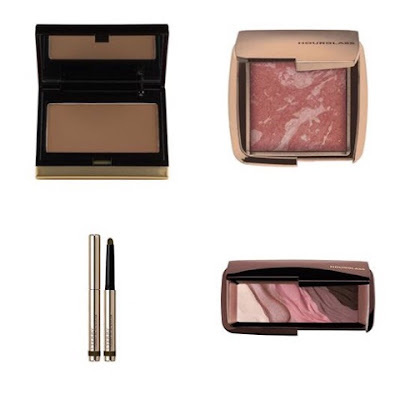 Top Right: Hourglass Ambient Lighting Blush £28 - I love Hourglass products though I have never tried any of their blushes. I have heard really good things about them giving a 'radiant natural finish' which is exactly what I look for in a blush. I personally love the look of the gorgeous rose shade 'Mood Exposure'. Bottom Right: Hourglass Modernist Eye shadow Palette £56 - Another Hourglass product I haven't tried yet is their eye shadows, and this palette looks seriously amazing! They have a range of different shades but this purple toned palette in the shade 'Monochrome' particularly caught my eye as I feel like plum tones compliment my green eyes. Bottom Left: By Terry Ombre Blackstar £29 - These eye shadow sticks from By Terry have been on my 'To Buy' list for quite a while now. I love eye shadows in a 'stick' formula as they are so easy to use. 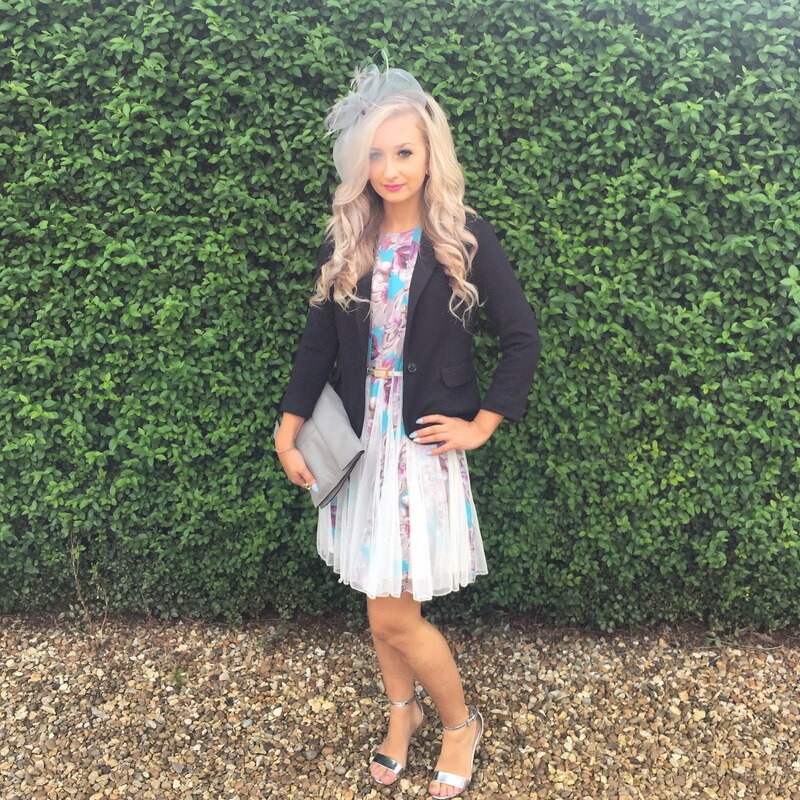 I have seen Gabby from 'Velvetgh0st' on YouTube use these before and really liked the finishing look it gave her. What would be on your beauty wishlist from Farfetch? Let me know in the comments!